I was able to get in on the early bird deal for the Omnia, so for me it was only $200 including shipping. I can safely say it’s worth every penny of it. In addition, the auto-updater will reinstall certain packages even if you removed them manually. Apart from that, everything is great. The 12 LEDs on the front can all be individually colored and can be either left to be controlled by the hardware (except for the PCIe and user-defined LEDs) or have triggers manually specified. The device easily has enough horsepower for the purposes of a networking device, and there is a 2GB RAM upgrade available. As for networking, the main switch (the 5 LAN ports) has two connections back to the CPU, allowing for more bandwidth on topologies with multiple internal networks. The WAN port automatically switches between TP and SFP, allowing you to connect to certain fiber ISPs without a modem or interface converter. The system provides three miniPCIe slots, with the one closest to the CPU supporting mSATA and the one furthest away supporting a SIM card. The middle slot is pre-filled with the full-length 2.4/5GHz Wifi card, with the one closest to the CPU having the half-length 2.4GHz-only card. This means that if you want to use a third full-length card or cellular card, you’re good to go. 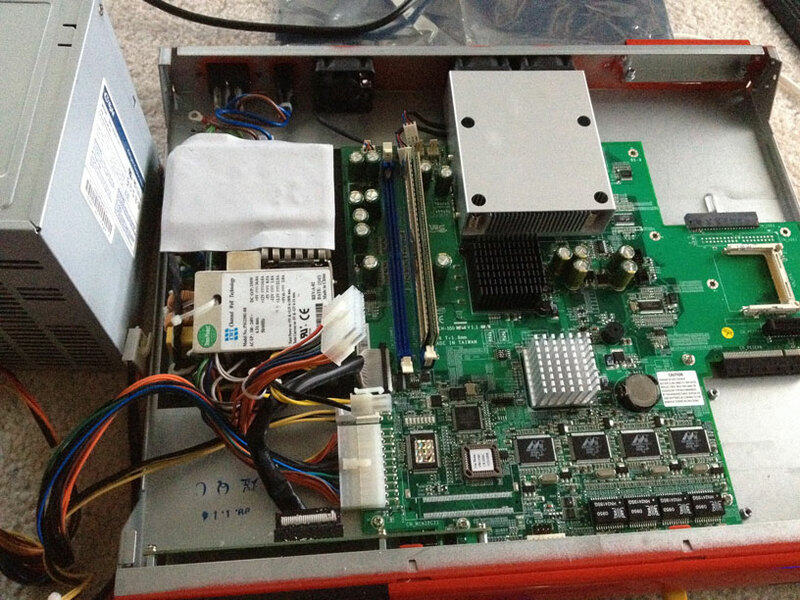 However, if you want to use an mSATA drive, you’ll need to move the 2.4GHz card to the SIM slot. This entails taking the entire board out of the case, since you’ll need to move the mPCIe standoffs from half-length to full-length and vice versa, which requires taking the board out of the case. You might have to do that anyway if you aren’t careful, as I was able to make one of the standoffs come unscrewed simply by trying to remove the card. Other users have also reported some lose screws. The case itself has five holes for bulkhead-mount pigtails/antennas. It comes with three 2.4/5GHz antennas, with the outer two using signal combiners/diplexers to run on both 2.4GHz and 5GHz, with the inner antenna being 5GHz only. You can use the extra two antenna holes to add extra antennas for a third band or a cellular modem, or just add dedicated 2.4GHz antennas rather than using diplexers. However, this might prove to be insufficient antenna holes when 4×4 MIMO hardware becomes more commonplace (Compex has a card in the works, but it’s currently in pre-order, and only then it doesn’t include an RF shield). Still a downgrade from the 16 antenna holes on my RSPro case. The board also provides plenty of headers to use. 10 GPIO lines, 2 UARTs, JTAG, and a 12/5/3.3v header which could be used to power a hard drive (assuming it supports enough current). It also has 2 USB 3.0 ports, a nice step up from the RSPro’s single USB 2.0 port. One very useful feature is schnapps, which is a program that manages BTRFS snapshots. You can make use of the second reset mode (hold the reset button until two LEDs light up) to reset to the latest snapshot. This allows a faster option to get the router up and running in case of locking yourself out, but you lose the ability to drop into a rescue shell to fix the problem non-destructively. In addition, resetting with 3 LEDs on reverts to the factory snapshot. If it’s still hosed, mode 4 allows for a reflash from a USB drive, while 5 LEDs enables a recovery shell via UART. This has several advantages over the more traditional squashfs root + RW overlay, but has the disadvantage of not having compression. It also keeps the kernel in the filesystem and allows it to be updated, something that you would normally have to reflash for. Overall, I’d give it a 9.5/10. Only things stopping it from being a 10 are the aforementioned software bugs, and a possible lack of future expandability as M.2 replaces mPCIe. I ran into the same issue with the RSPro and its miniPCI slots, but the difference here is that mPCIe to M.2 adapters are readily available, cheap, and still offer enough bandwidth (500MB/s per slot with the Omnia’s PCIe 2.0) compared to the much less common miniPCI to miniPCIe adapters which would be a bottleneck anyway once Wifi starts breaking gigabit speeds. As for >1gb WAN connections, you might run into trouble there, but in theory, it would be possible to rig a 10GbE card up to the Omnia and still have it operate at 4gb/s. Need WiFi in a Firebox? No problem. You just need a PCIe to miniPCIe adapter, a PCIe flex adapter, and a Wifi card (preferably one that supports AP mode of course). Now, I made the mistake of trying to do this with the WLE900V5-27 as pictured. It’s a great card if you can get it to work, but barely worth the hassle. 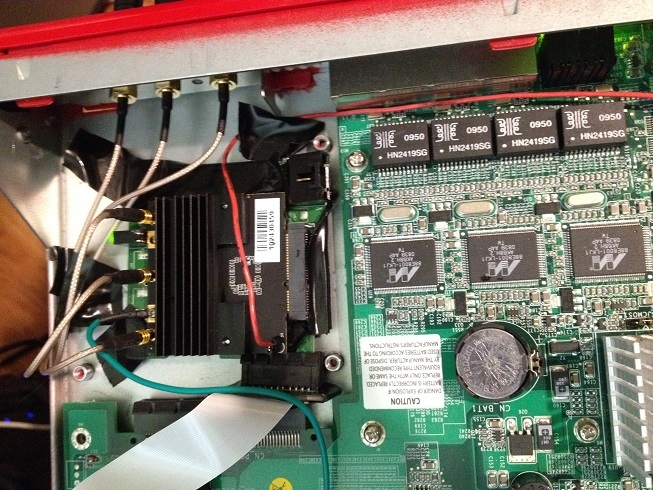 The card uses external ground and 5v connections, and it’s massive. The two problems that the card’s size presents are that you need a miniPCIe adapter with enough space around the slot (I used the MP2W), and you have to deal with the huge RF shield on the bottom of the card too. The RF shield means that not only can there not be any components on the board below, but you’ll also have to tape over anything possibly conductive. I used the MP2W adapter, which came with some capacitors which were in the way of the card. Fortunately, they weren’t necessary for the adapter to function so removing them was safe. Unfortunately, I missed a part that needed to be insulated the first time around, so one of the FFC cables let some magic smoke out and I had to switch to the other one. Nothing else was damaged so everything worked fine once I fixed the insulation issue. On top of that, the card uses MMCX connectors, so you’ll have to get different pigtails as well. As for actually mounting the pigtails/antennas, the easiest way is to take the PCI bracket the adapter comes with, take the pieces that hold the card to the bracket, and bend them so that they’re parallel with the rest of the bracket. Then, you can secure it in place with whatever means necessary. Quick script for controlling the arm/disarm LED, created from the info here. I took a quick stab at trying to make WGXepc run on Linux but didn’t have any luck, so I just created this instead. Unfortunately since it’s just a single bidirectional LED, there’s no way to get the green and red on at the same time. These addresses and values are for the X-Core-e boxes. For other boxes, look in the WGXepc source (available here) to find values and addresses. The value that you printf is the value you want to write, while the seek value for dd is the address, converted to decimal. Still not sure how to control the disk or expansion LED.